Lean Coffee is a highly productive meeting form where participants are engaged and topics are based on the needs from the participants. 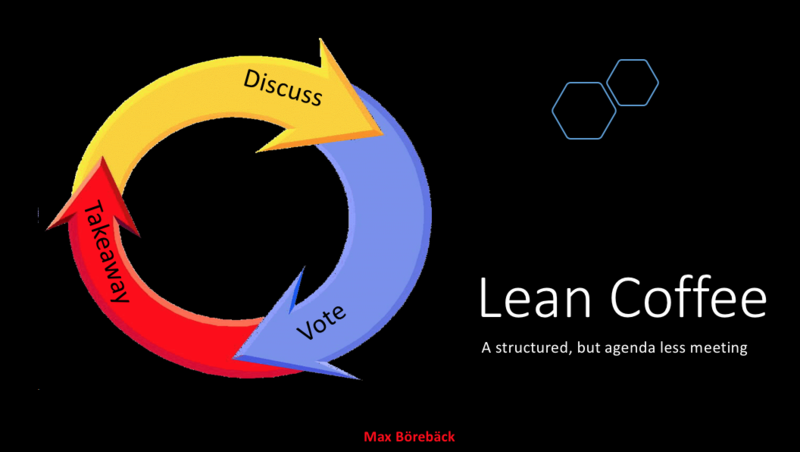 I am participating in regular meetings where we discuss Scrum, Lean and other things every Wednesday in a Café in Stockholm from 8:00-9:30, its an open meeting so you are free to come and go as you need. Some people has been participating almost every meeting for the last 10 years, I am going there when I have an opportunity. The meetings are extremely efficient, and I always leave with new knowledge. The methodology is very simple and straight forward, watch the video and I will teach you how you get started. Lean Coffee started in Seattle in 2009. Jim Benson and Jeremy Lightsmith wanted to start a group that would discuss Lean techniques in knowledge work – but didn’t want to start a whole new cumbersome organization with steering committees, speakers, and such. They wanted a group that did not rely on anything other than people showing up and wanting to learn or create. A teaser, How does it work? Write down the topics that you want to discuss on the post it notes, if possible, write full sentences to make the topic clear and easy to understand afterwards. Put the timer on 7 minutes, when time ends you have to vote for more time to discuss, thumbs up means you want to continue, if that is in majority put timer on 3 minutes, when time ends you vote again, you continue like this until there is more thumb downs than up. Move topic to key takeaways column, Reflect over your key takeaways, write them down on post it notes, when all is done read them out loud. Now continue with next topic, by moving it to discuss, put timer on 7 minutes, vote, and write down your key takeaways. You end the meeting when you run out of topics or you run out of time. During the Lean Coffee meetings I have participating we usually run out of time. The topics that were not discussed are left, and if it was yours, you can bring it to next meeting if it is still important for you. Good luck now, and watch the video for a more comprehensive introduction to the concept.